Her comic book superhero allows readers to discover who they are. Artwork and creativity elevate people’s view of themselves and disrupt negative stereotypes about what others think, author Gabby Rivera told students Oct. 1 in the auditorium of McAllister Fine Arts Center. “It doesn’t take much. You’d be surprised,” she said to an audience of about 60. The event is part of this college’s observation of Raza Heritage Month and LGBTQ History Month. She explained the words that define who she is and what she does. “Queer, Latinx and joy. They might seem like obvious words. For me, there’s more to it than that. For me, queerness is this incredible gift from the universe. It is this whole other lens of power and strength and beauty, all in how I love people, all in how I connect to other folks,” she said. “It is the power I have to completely change the world around me. So I have a good time with it,” she said. Rivera said the term “Latinx” reflects Hispanic people’s heritage and where they are from. “Latinx. That’s a funny word,” she said. “It’s one of those words that doesn’t mean anything, really. But it points to where you are and where you’ve been only if you accept that, and that’s your term. “And the funny thing about Latinx is that even though it has no significance in it of itself, there’s a consciousness brewing in this country for us,” she said. She explained “joy” allows people to make those connections. “It is the thing that holds us together. It is the thing that allows us to be a community. It is the thing that allows us to connect with others,” she said. Rivera authored the book “Juliet Takes a Breath,” a story about a woman who interns for a writer, discovering a new environment from what the character is used to. The book was published Jan. 18, 2016, by Riverdale Avenue Books. 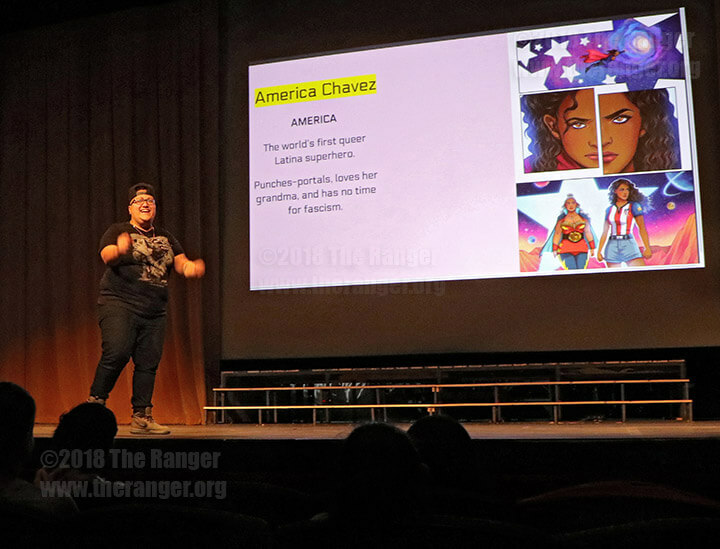 Rivera also wrote a comic book series for Marvel surrounding the queer Latina superhero, America Chavez. “I took a couple of different approaches with America, and a lot of it started with what is important to me,” she said. The comic books have gained attention worldwide for starring a queer Latina woman as the main character. “When I put America Chavez on a page, there is permission for everyone reading her to go on the same journey as she is going on,” she said. Rivera has been writing from a young age and started with poetry but found short stories and fiction more comfortable.